A Vulnerability has been discovered in the wildly popular messaging app WhatsApp, which allows anyone to remotely crash WhatsApp just by sending a specially crafted message, two security researchers reported ‘The Hacker News’. Two India based independent security researchers, Indrajeet Bhuyan and Saurav Kar, both 17-year old teenagers demonstrated the WhatsApp Message Handler vulnerability to one of our security analyst. In a video demonstration, they showed that how a 2000 words (2kb in size) message in special character set can crash Whatsapp messenger app. Previous it was discovered that sending a huge message ( greater than 7mb in size) on Whatsapp could crash victim device and app immediately, but using this new exploit attacker only need to send a very small size (approx 2kb) message to the victim. 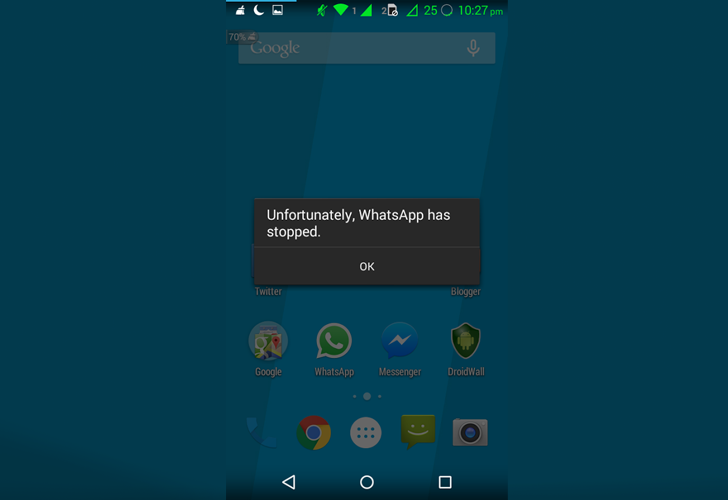 The worried impact of the vulnerability is that the user who received the specially crafted message will have to delete his/her whole conversation and start a fresh chat, because opening the message keeps on crashing WhatsApp unless the chat is deleted completely. "What makes it more serious is that one needs to delete entire chat with the person they are chatting to in order to get back whatsapp work in normal," Bhuyan told THN in an e-mail. They have also provided the Proof-of-Concept (PoC) video for the attack, users can watch above. WhatsApp was in news recently for making end-to-end encryption on all text messages as a default feature in an effort to boost the online privacy and security of its users around the world. The app maker describe this move as the "largest deployment of end-to-end encryption ever."